I’m sharing a recipe for homemade Mini Cream Cheese Whoopie Pies. My son calls these homemade oreo cookies and while I agree they are close, I think they are in a class all their own! Print off the recipe at the bottom of this post and then visit my friends! In large mixing bowl, place cake mix, shortening, and eggs. Beat with an electric mixer until well blended. Batter will be stiff. In large mixing bowl, place all filling ingredients. Beat with an electric mixer until light, fluffy, and well combined. Put small amount of filling on bottom of one cookie and top it with the bottom of another to make a sandwich. Enjoy! 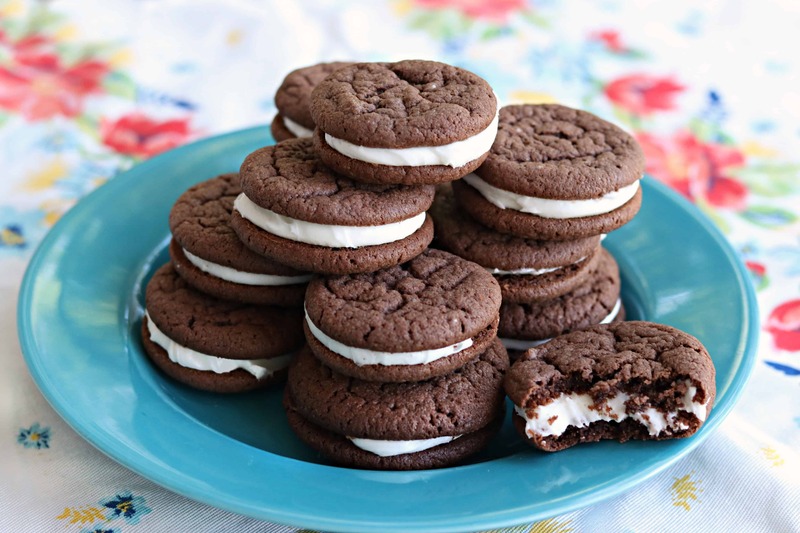 I hope you get to make these mini cream cheese whoopie pies soon! Follow me on Instagram for behind the scenes photos! See the entire index of Southern Plate recipes by clicking here. Ha! you and me both! Love you and all you cook, Jackie! These look amazing! I’ll take a dozen, please!! I love any recipe that starts with a cake mix — that’s my kind of baking! 🙂 These sound so perfect! Ain’t that the truth! Especially this time of year! Thanks for being here, Blair! I will be trying these for sure! I love that is starts with a box cake mix…. I bet you could do other flavors as well! Red velvet? Do you think that these could be made ahead of time and then frozen? I would love these but my husband would not eat them as he doesn’t like cream cheese in anything. Marshmallow cream would be wonderful in these. These look delicious!!! I can’t wait to try this recipe! Thank you Lynn, I hope you get the chance to make them soon!! !